In February 1968 I traveled to Australia as a young Karitane Nurse. Recently the letters I wrote home were discovered, my Mother had kept them all and some of the snippets, I think, are worth repeating here. Remembering I was raised on a farm in Central Otago and then I had been to boarding school so I had a rather sheltered up bringing!! My letter writing was prolific, 3-4 pages hand written most weeks. 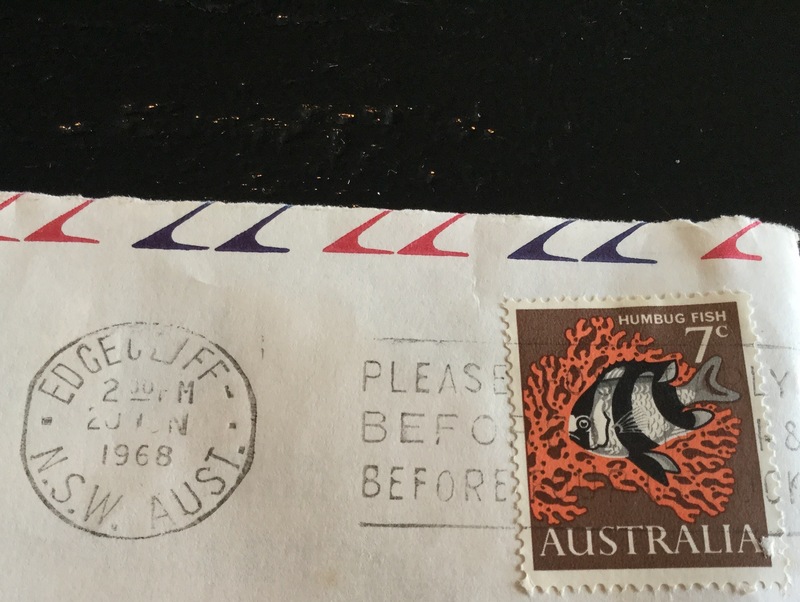 Postage was 7c Airmail to New Zealand. I was in Australia for about 10 months waiting for a a VISA/ Green Card to come through enabling me to go to work in the USA. 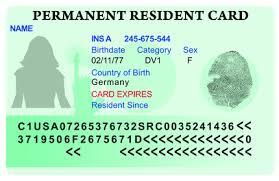 Initially they said a few months but in fact it was almost a year before that Visa arrived. Meantime I Karitane nursed for a number of fascinating Australian families. I had a cousin In Sydney and another in Armidale so between * ‘cases’ I would stay at their homes. It was a very unsettling time as I didn’t know when the visa might arrive. I dated several interesting chaps and enjoyed formal military dinners, sailing, picnics and theatre shows, movies and cocktail bars. All a far cry from my previous life in New Zealand. I saw moving foot paths, (travelator or travelotor depending which dictionary you read ) and escalators for the very first time. I ate foreign food such as Chinese and crab meat! I discovered tin foil and posted some home to my parents. * ‘cases’ was the term given as we lived out of a suitcase moving from one family to the other, often for 2-3 weeks at a time. 1968 1968 1968 1968 1968 1968 1968 – 49 years ago!!! Airmail paper letter to home. Also how the double-decker bus took 2 hours to travel 20 miles up through the Northern Beaches. I saw “hippies” at Kings Cross and a strip joint called “The Stripadelic”.I commented on the girls ‘working the Cross’ in bikini’s with a two bar heater on behind them in a doorway to stop them from freezing; my eyes were wide open! I bought a bottle of Moselle for 77 cents and paid 26 cents to go on the Manly Ferry. I mentioned the Opera House and that the roof weighed 21,000 tons. It was under construction not actually opening until 1973. I commented that it was 120 degrees hot and I found the inner city ‘ creepy’ by ones self especially around the Hyde Park area. I’ve always hated spiders and I mention the very large spiders in several letters home. I talked about the Royal Easter Show and how NZ beat Queensland in the Polo final and how exciting it was. How I enjoyed the oysters and champagne! I had my hair done at David Jones and commented the place was large with 50 hair dryers and cost me $3-50. I went to the Red Door Elizabeth Arden Salon to be pampered. I discovered dimmer light switches for the first time and commented ‘they are terrific! 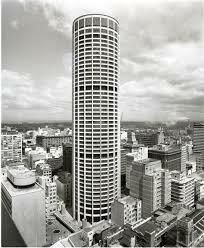 Australia Square opened; a 47 story round tower and the tallest building in Australia. The lift went to floor 47 in 23 seconds, impressive stuff to this farm girl. Dinner at The Summit was $10.00 dollars, $1.00 to go to the 48th floor to see the view! I shouted my Mother dinner there when she visited me. Now days we take all this in our stride. I was quite opinionated about people – ummm! ( I like to think I’ve mellowed.) I wrote the following about Australian men “The men I’ve met aren’t the type of guy that I like. Just as well, be awful if I fell in love with some big, selfish, bad mannered Australian twit which so many seem to be” – funny because I did date an Aussie for a year or so after that!! At one stage I also dated a Duntroon graduate with a red MG with Kangaroo skin interior, seriously! I attended my pen friends wedding in the Duntroon Chapel in Canberra. I travelled from Sydney to Armidale in Northern NSW on a diesel train , air-conditioned. On the train a can of beer was 32 cents. Armidale shocked me as it had night carts!! I’d never heard of such things in Central Otago! ( Mind you on the farm we had a long drop I still recall!) The winter was very cold in Armidale and I worked at the University in the Agronomy Dept for a month or so as well as * ‘casing’ on a large sheep station nearby. I traveled to Melbourne by train, 1st class, and the ticket cost $18.50 – more than to fly. The train was the Southern Aurora. I was only there a week and I was staying a way out in the suburbs with a distant relative, I recall in a very small house with few amenities. About then I decided suburbia wasn’t for me. I headed back to Sydney and although I stayed in Mosman it was vibrant, affluent and an enjoyable suburb of Sydney. Now days I still travel to the USA annually and we still see Americans running amok with guns, more powerful than pre 1970! Crazy… The constitution was written before AK 47’s – Ban those and you might see a reduction in random killings of innocents I say. Anyway. More than 1.5 million civilians have been killed in the US by guns since the late Sixties, staggering statistics. Enough about guns, just interesting that it concerned me back in 1968 and still does. Finally late in 1968 my Green card came through so I headed back to NZ for two weeks and then set off on a huge adventure. I was off to Karitane Nurse ( Nanny) to one of the wealthiest families in America. That is however another story for the future! I’m delighted my mother kept my letters, they gave me an insight to who I was aged 22, how life and people evolve and change. I’m glad we wrote letters back in those days too, because I doubt anyone prints and files away their kids emails sent home from their OE. Perhaps you should. And there are very few photographs to record those times either. I trust some of you smile when you read this, you will have had similar experiences. This entry was posted in Thoughts, travel and tagged 1968, airmail letters, Armidale, Australia, Australia Square 1968, Dear Mum and Dad, escalator, green cards, gun.laws, handwriting, Karitane Nurse, Kiwi OE, Melbourne, Mosman, New Zealand, Southern Aurora train, Sydney, travelator, working holiday, writing letters by kiwigrannz. Bookmark the permalink. I recently saw a book of war stories from letters, revelaed sooo much to the family… very precious to own. Lynn that was so good reading the snippets. Well done MUM for keeping them. Geoff and I kept the letters we wrote to each other while he was in the army 51 years ago. We kept them for ages, even the kids had a sneaky read of them when we lived in Beaumont. They were in a tin in one of the wardrobes. We did have them when we shifted up to Ashburton but I have a funny feeling we decided to biff them. I must check!!! Great reading Lynn – I think I may still have letters that my mother kept from when I was at boarding school – I must have a look. Your comments are fascinating because so much has changed – and so much has not! You will find them very interesting I’m sure..maybe ablog one day? ?